A judge set bail Sunday for a man and woman accused of beating and robbing an Anchorage taxi driver, a day after they were arrested. Shirley Borrero Qinones and Hector Rivera, both 21, are charged with felony robbery, assault, theft and fraudulent use of an access device for an attack on a taxi driver who responded to a call to help with a car lockout, according to charging documents say. A few days after the incident, a second cab driver was beaten and robbed under similar circumstances after he drove to West High School to pick up a couple who said they were locked out of their car. Qinones and Rivera have not been charged in that robbery but police have said they are exploring the connection. 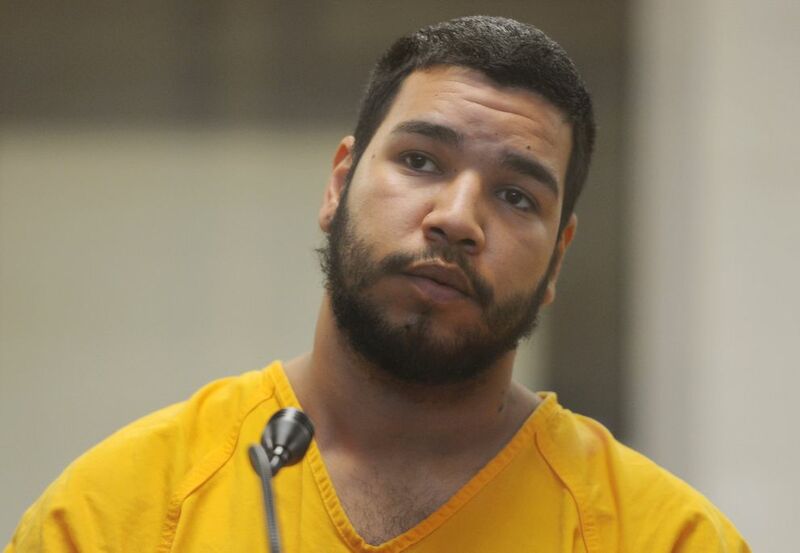 Qinones and Rivera appeared in Anchorage jail Sunday. 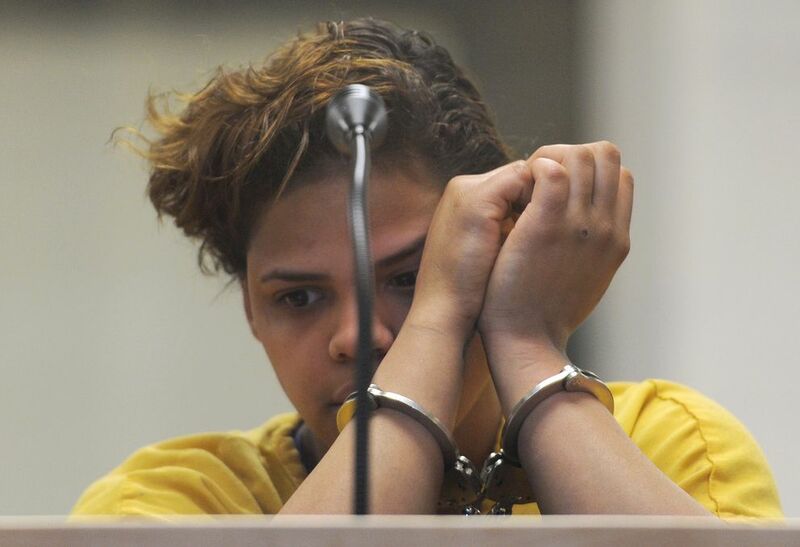 Qinones, 21, wearing a yellow jail jumpsuit, cried at the podium as she was being arraigned and answered questions so softly the judge asked her to speak up. She said she did not have a job or money for a lawyer. Rivera, 21, also said he had no money for a lawyer and no job. When he briefly tried to speak directly to people in the courtroom the judge warned him to stop. Charging documents against the two detailed the alleged attack in new detail: The taxi driver was dispatched to the Ulu Factory in Ship Creek on March 22 to help a person named "Joe" unlock his car. When he got there a man flagged him down and led him to a parking lot at the Ship Creek Overlook Park. When he opened his trunk to get tools to help with the lock out, he was pushed inside. Two people punched him in the head and chest and a man pulled out a gun, pointed it at him and said "I'll shoot you," according to the charging documents. The two people took his wallet, iPhone and $400 in cash and tried to shut him in the trunk of his own car but closed it on his legs instead, the charging documents say. They drove off in a Ford Fiesta. The driver's employer called police when the cab's emergency switch was activated. When police arrived, the driver had blood on his lips, scratches on his ankle and said his chest hurt. Surveillance footage from inside the taxi back up the driver's account, police said. Police got an anonymous tip that Qinones was involved in the robbery, the charging documents said. When they investigated, they found that bank cards stolen in the robbery were tracked to two different Chevron gas stations, where they had been used to buy merchandise and gas. Gas station footage showed Qinones and Rivera using the taxi driver's bank card. Police announced a warrant for their arrest on April 6 and took the two into custody a day later. Qinones has no criminal convictions in Alaska. Judge Smith found "clear and convincing evidence to deviate" from a pre-sentencing report from the Department of Corrections defendant risk monitoring system and set a higher bail for her. Smith set Qinones bail at $10,000. Rivera had been convicted in January of misdemeanor assault, violating a protective order, using a phone for harassment and unlawful contact with a witness. His bail was set at $50,000.